You are ordering a 2017 Subaru Outback Ice Silver Metallic G1U/GE2 Touch Up Paint Pen Kit by PaintScratch. You MUST VERIFY YOUR VEHICLE's COLOR CODE IS 'G1U/GE2' to ensure you are ordering the correct paint color. DO NOT order based on the product picture or color name on this page. Where to find your color code: Color code is located on a color plate on top of the drivers side strut. Paint pens are easy to control and help prevent the "blob" problem often seen using a brush. If you have very small areas (less than a pencil eraser size) to repair, this Paint Pen Kit is ideal. For larger areas, we recommend the larger bottle and spray can sizes. Use the included Rubbing Compound on the clearcoat to get the best shine. Kit includes: 1/2 Ounce Ice Silver Metallic Paint Pen, 1/2 Ounce Clearcoat Pen, 2 Ounce Rubbing Compound, and a pair of gloves. Paint Pens are similar to a felt marker but with a firmer chiseled tip. Automotive paint is very hazardous. Keep away from children. Do not use any of the products until you have read and understand the product directions and warnings. We recommend rubber gloves, chemical respirator, safety goggles and to work in a well ventilated area. Please store the materials in a safe place. 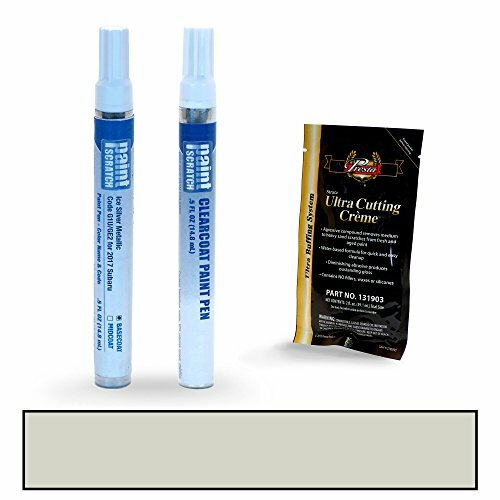 Kit includes: 1/2 Ounce Ice Silver Metallic Paint Pen, 1/2 Ounce Clearcoat Pen, 2 Ounce Rubbing Compound, and a pair of gloves. Paint Pens are similar to a felt marker but with a firmer chiseled tip. Where to find your color code: Color code is located on a color plate on top of the drivers side strut. IMPORTANT: Please no returns. DO NOT order until you have verified your vehicle's color code is 'G1U/GE2'. We custom mix your paint to match your vehicle's original factory color code and it will not work on any other vehicle. If you have any questions about this product by PAINTSCRATCH, contact us by completing and submitting the form below. If you are looking for a specif part number, please include it with your message.